In the spring of 2005 I stood on the roof of the Student Union building in Berkeley, overlooking Sproul Plaza, where I had lived through the exhilaration of the Free Speech Movement four-plus decades earlier. Milling about behind me were about thirty or so young adults, the youth contingent of the first Spiritual Activism Conference convened by Rabbi Michael Lerner and myself. It was impossible not to compare “then” with “now,” and I found the comparison instructive, even inspiring. Listening to them, I ticked off the critical mistakes we had made in those heady days of protest, and it was immensely reassuring to note that the folks around me had made a lot of headway correcting them. Back then we were, of course, dead set against racism, or tried to be (the FSM was an aftershock of the Civil Rights movement) but these young people were totally color blind. I heard even more progress in an area we had barely touched on: fully integrating women as true equals. We famously “didn’t trust anyone over thirty” (that became a bit awkward for me in ’67 when I slipped over the line! ), but the concept of “mentor” had subsequently come in to make it acceptable to benefit from an older person’s experience — absolutely critical for a movement facing, as we still do, sophisticated, if wrong-headed, opposition. I had fond memories of cafes where we sat arguing about Camus and Marx (not that we read the latter), which was a really good thing, but none of us, as far as I remembered, was fully aware what was happening to the earth, not to mention getting our hands dirty in her by growing food, or building composting toilets; a few of these people, by contrast, had come fresh from their organic farms up in Oregon, still in coveralls. And then the most important change, in my view: we had been in a state of near-total ignorance about nonviolence. They were considerably more sophisticated of nonviolence, and happily that awareness has taken another leap in the last few years. But one thing that had not sat well with me in 1964 was not much improved in 2005 and is still an issue today in the amazing #OWS movement: the issue of leadership. Leaderless movements, to be sure, are not the aimless, decapitated things they are taken for by mainstream commentators, and OWS in particular has dealt with the issue good-humoredly. I believe it’s Occupy CO that anointed a border collie, Shelby, with her backpack, as their official spokescreature. “She is more like a person than any corporation,” they said. More to the point, leader or no leader, it is succeeding to some degree in keeping order and charting a course for itself — backing away somewhat from contested sites and switching “from places to issues,” wisely. Yet for this and any future progressive movement I feel that a philosophy, a vision, and a strategy for realizing that vision will be essential, if for no other reason than the clear, consistent, and compellingly simplistic message of conservatives. And for all this, as well as sheer efficiency, leadership could be of enormous help. Can we have a kind of leadership that could help us stay more focused, more efficient, than the “horizontal,” everything-by-consensus style that has been the political culture of progressive movements? Can we relax somewhat the ideological aversion to leadership that has come to dominate progressive thought — and, I think, slowed the movement down — and open ourselves, to some kind of discriminating leadership that will not inhibit individual responsibility — for many of us feel, myself included, that individual responsibility lies close to the core of the world we want? I believe that we can; in fact, this kind of leadership was one of Gandhi’s most striking achievements. No one was able to evoke the self-leadership potential of his followers while still giving tight focus to huge campaigns — calling off whole Satyagrahas (campaigns) when even a few people were unable to contain their own violence, directing the switch to “constructive programme” when direct resistance became unworkable, etc. Some feel it was Gandhi’s greatest contribution to turn ordinary men and women into heroes. 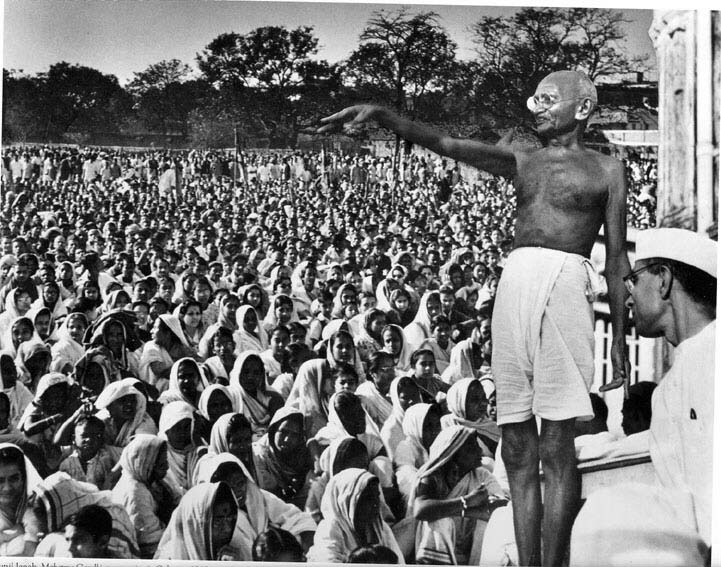 As many of us know, when he and virtually the whole leadership was arrested during the Salt Satyagraha of 1930 leadership devolved, successfully, onto every individual. Yet, while it may seem counterintuitive (most of my students were shocked to hear this), in the heat of struggle Gandhi said, “I am your general, and as long as you want me to lead you, you have to give me your implicit obedience.” How is this different, to take an extreme example, from Hitler telling his generals when he launched the disastrous campaign in Yugoslavia (a blunder that in fact cost him the war), “I do not expect my generals to understand me; I expect them to obey me”? Of course, Gandhi sets the bar pretty high! But a high bar makes the qualities we need at least visible, something to strive for. The opposite of bad leadership, then, may not be no leadership, but good leadership — and followers alert enough to tell the difference. But where’s the rest of the article? As a refugee from the 60s, the only example of leadership I’ve seen is Democratic Centralism – which of course led to the death of the New Left. But it’s the surge in interest in strategic non-violence which gives me some hope for the future. Gene Sharp is unapologetic in the need for leadership, but I have seen very little discussion about the issue more widely. This is a good start, but I would certainly like to see more discussion. Slowed down movements are better than being misled, power seems to have negative effects on people generally. The Gandhi example is actually terrible as when you move away from the myth, you realise just how violent the transition in India was. There are even indications that he even held up crucial decisions with his approach. I agree with your two prescriptions at the end. I’m interested in how you are defining power. Might it have another definition than the one you are using which would open this discussion some more to get at what Nagler is addressing here? Some more food for thought? Was Gandhi’s nonviolence or the violence of the Raj that led to violent partition? I have to admit that Waging Nonviolence picked a poor image of Gandhi for this article, drawing from a stereotypical image of what we imagine as leadership. There are other photos that could have said it much better. “We need a Gandhi.” In the 1930s and ’40s, that’s what leaders in the struggle against segregation believed, long before anyone had ever heard of Martin Luther King. Reading newspaper accounts about the Indian independence movement led by Gandhi, blacks saw what their own efforts were lacking then: a moral leader, someone unafraid to fight on the front lines, not seeking anything for himself in return. * wisdom — understanding that nonviolence is the only way to struggle for justice, and that any struggle for justice must enlarge the rights of everyone involved. The sum of these qualities is often mistakenly called charisma. It is really moral perfection. That brings us to the other requirement for a movement bent on reshaping an open society: religion. Devotion to nonviolence by itself is not enough. In the African-American struggle for civil rights before 1955, A. Philip Randolph, James Farmer, and Bayard Rustin all attempted to apply Gandhian nonviolence to the problem of segregation. They did not succeed. (cf. Sudarshan Kapur, Raising up a prophet, 163) Not until the Montgomery Bus Boycott was proclaimed from the pulpits of Montgomery’s black churches in December of 1955 did the African-American struggle for justice really take off. Gandhi and King were, above all, religious leaders. They fought through peaceful means, but they did not bring peace. Like religious leaders before them, Gandhi and King brought division because the movements they led challenged those in power for upholding unjust laws. Professor Nagler is right to call our attention to the need for a leader in the struggle for economic and political equality today. But no ordinary leader will do. We need a Gandhi. We need a King. Very interesting to hear from someone who has experience with social movements. But I wonder if Nagler could clarify about the situation of leadership in the free speech movement. I just read Jo Freeman’s article, “The Berkeley Free Speech Movement,” and she said that it DID have leaders. This can be proven, Berkeley now has the name of a free speech movement leader enshrined on the steps of its administration building. And unlike Occupy Wallstreet, this movement seemed to be ok not only with appointing leaders, but with with the “majority rules” principle. Moreover this is a movement that actually met with some success in pushing its demands for free speech on campus. I mean read the Freeman article. Occupy doesn’t hold a candle to this. Very interesting to hear this from someone who has been educating others on non-violence. Its in-line with the “non-vio” campaign happening in U.S. I became motivated with the campaign. Please check the “www.nonvio.org”.